After I saw Sammi where this during her trip to Santorini I knew I had to have it! 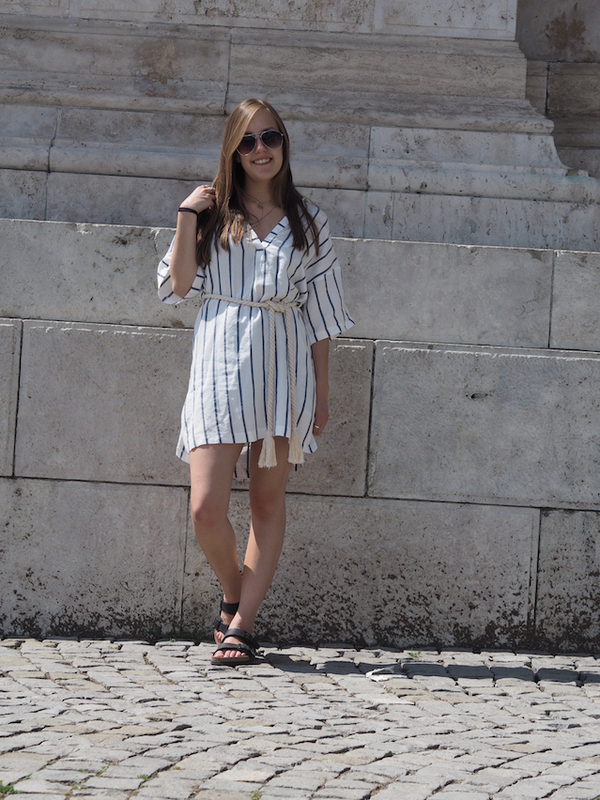 Although it definitely screams Greek vibes I still couldn't help myself and in all honesty it was perfect for a day of trekking around Budapest. It never made me feel hot or sticky or even itchy in the hit and if anything I think it helped keep me cool even if we did have to stop for ice lollies and dips in fountains. I absolutely adore the rope belt as it gives such a beachy vibe, which as you all must know by now is right up my street! The one thing I will say though is I wish it didn't have the collar feature as for one you can see it stick out quite a bit at the back for me and two I just don't think collars particularly suit me in all honesty even though I have no idea why. Even so I'm sure I'll still get lots of wear out of it if the weather perks up in good old England as I want to wear it so much more! Birks. What can you say about them? Every blogger had the, last year and they're still wearing them this year. I was put off by the price I couldn't part with that much money but after searching and searching trusty amazon came to the rescue and I think if I remember rightly I ended up saving a good £20 from purchasing through them, so if you're like me and can't part with the expensive pricing I really recommend checking out amazon because they really are as comfy as everyone says, I mean I walked around pretty much the whole of Budapest in them! I moved back to Brighton from University in Roehampton a few weeks back and made the decision to spend my final year commuting from home after lots of discussions with friends and family and a pretty rough year. Although I felt a little sad that I won't be fully involved in University activities like everyone else will be, I do feel like it was the best choice considering every time I had to go back after a weekend or a holiday I would end up crying (insert monkey covering the eyes). I do also need to remember that I have a few wonderful people that still will be living near the University that have said they're more than happy to house me if I want to join in the events and nights out as well which would be exciting! Also starting September it's only 9 months and then I'll be closing the University chapter and entering the real adult world so I can definitely do this and as well as it holding nerves I do feel quite excited knowing I don't have to leave this wonderful city of Brighton! so cute! I love that tassel belt! What a cute outfit ! I love those strips ! Love these stripes!! Especially with the Birkenstocks! LOVE this dress - perfect for holidays, I love the rope belt too! Lovely outfit, it suits you perfectly! This dress has been on my wish list the whole summer! I absolutely love it on you! Adore this dress, so stylish! Awesome dress! Very summery & Mediterranean look. Looks great with the sandals!